Firstly an observation. As Richard North posted several days ago, stock pictures of the ship in port show a large EU symbol on the bows, aft of the ship's name. Since then I have searched largely in vain for a shot of the waves lapping around the symbol as it slowly sinks beneath the sea. Aerial photos of poor definition show that it's still there, but none of the flush of hi-def close up pics of the wreck show this at all. Can there be a little bit of news manipulation here? Secondly, many have commented that the ship is lying on the opposite side to the gash in her hull, which is counter-intuitive. I can think of only one explanation, based on the free surface effect. In a vessel with a high centre of gravity, turning to port or starboard, or even the operation of bow thrusters, may induce a 'lean' in the direction of turn. 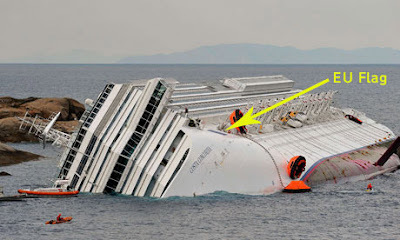 Normally this doesn't signify, but with an engine room deep in water and without longitudinal bulkheads, this may cause the mass of water to shift to the opposite side of the ship beyond the point of recovery of vertical stability. Unlike proper sea going ships like the QMII, which can take an Atlantic storm, modern cruise liners are like steel shoeboxes. If this is the case, I would expect MAIB to comment on the sea conditions in which it is safe for such British flagged vessels to operate. I seem to recall that widespread geriatric incontinence among the aged kitchen staff at my own boarding school lent the food a piquant flavour that cannot have been unfamiliar to many of our learned friends at Snaresbrook. And I daresay it does no-one any great harm. Just a few years ago, painting was old hat. The Turner prize never went to a painter. Saatchi didn't pay top dollar for paintings. Painters, even very good ones such as Freud and Patrick Caulfield, were relegated to the second tier. Unless of course the paintings were produced by spin machine or manufactured by impoverished art students in an East End factory, painting just wasn't cutting-edge. I'm not decrying the importance of the YBAs as a phenomenon of their time - Rachel Whiteread, Sarah Lucas and Tracey Emin will, in time, rise in reputation against Damien and their auction prices will equalise. But like the post-punk age, we've all been hanging about waiting to see what will follow the age of the YBAs and Saatchi, and the answer may well be ... painting. Certainly if Hockney's exhibition at the RA is anything to go by. Worth a trip up to London for, and worth £29.95 for the softback catalogue. Spielberg's Warhorse is worth waiting for the DVD release if, like me, you prefer to weep in private. The thought of being stuck in a cinema full of the openly lachrymose is really quite an unpleasant prospect. The moral message - good overcomes evil, love conquers all - is one I wholeheartedly support. It's a theme that also runs through every film made by the Disney studios, some of which are dreadfully crass in artistic terms, yet worthy still if they manage to win a single convert from the cinematic world of violent death and human degradation. Both Hockney and Spielberg, each in their own way, scores a small victory for Good. The red tops are picking up the gossip and rumour around the grounding and sinking of the Italian cruise liner: The captain was seen to spend the previous evening in the bar with a stunning blonde. As an act of braggadocio he promised to set an alternative course to get close enough to the Isola del Giglio to signal to someone on shore, but got too close. He fled the ship with the women and babies, covered in a blanket. All, to date, unjustified and unproven allegations that no doubt will be repeated and fill many column inches. Thank goodness for our own dear MAIB. I simply don't believe the Swissies are any more moral, fair, equitable and uncorrupt than Brits, or that the fairness and probity exercised by the Swiss communes are beyond the capacity of local Welfare panels in the UK. IDS' great behemoth of a Welfare State is as doomed to failure as its predecessor.